This past weekend, I gathered some of my best crew members and in just 8 hours, we were able to complete the majority of this restoration project. The weather forecast was 80% rain. 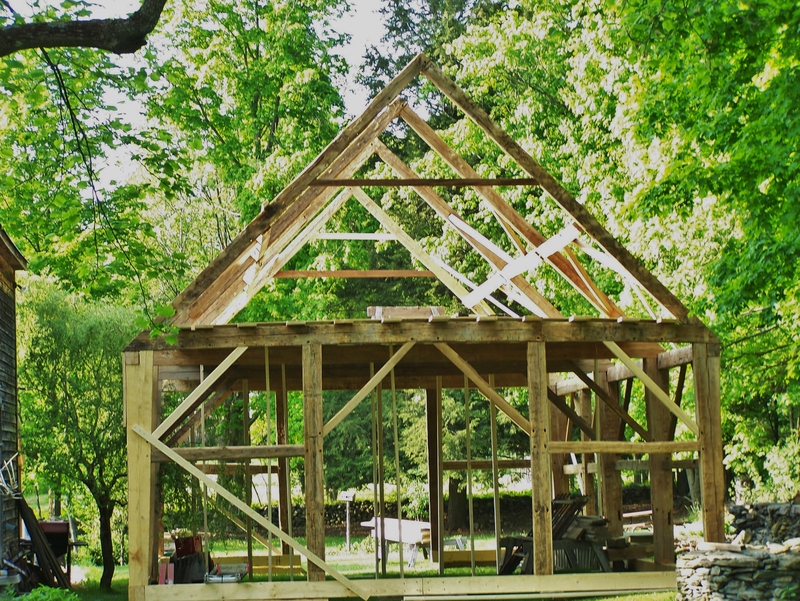 We were blessed with no rain and a great timber frame crew. We started work at 8:30 with the usual Blessing, asking for safety for all involved. 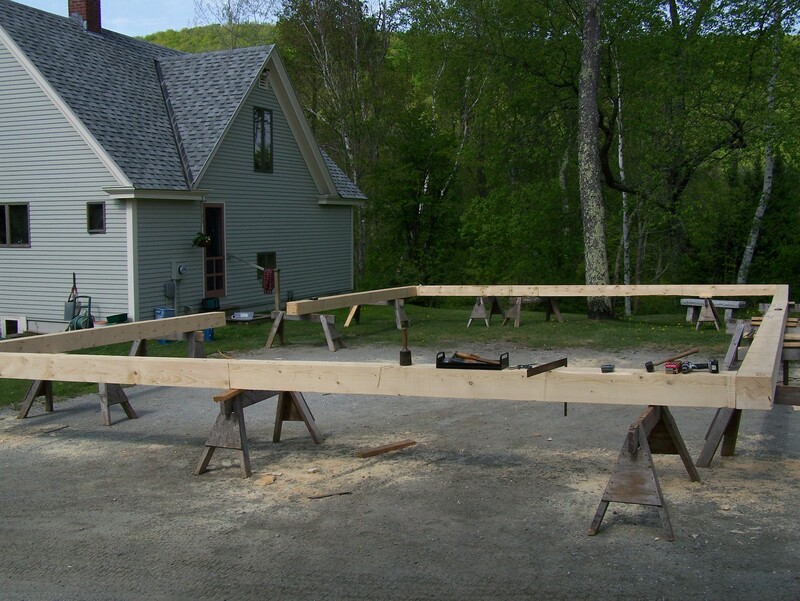 Thanks to a hardworking crew and Sissy’s delicious sandwiches, we set the last rafter timber by 4:30pm. Sue, a first-class crane operator, came down to help out so we could focus on placing timbers instead of worrying about back pains and where to find another six strong guys to help us with heavy lifting. Thank you Sue! I had made the sills at home beforehand because Sissy’s was hosting a wedding reception the day before and I didn’t want my hammering to disrupt the festivities. These sills will form a sort of platform where the restored timber frame rests. We started by putting the sills in place on Sissy’s lawn. 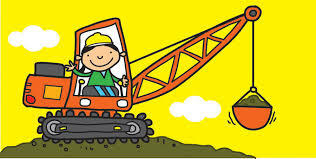 Unfortunately, there was no room for a crane so we had to stack various frame elements on top of each other. Having an experienced (and fun) crew makes all the difference and was a huge part of the success of the day. For this special project, I gathered guys who I’ve worked with over the last 10 to 20 years. The project felt almost like a reunion and we were all dedicated to working hard, staying focused for 8 hours and seeing just how much we could accomplish by the end of the day. 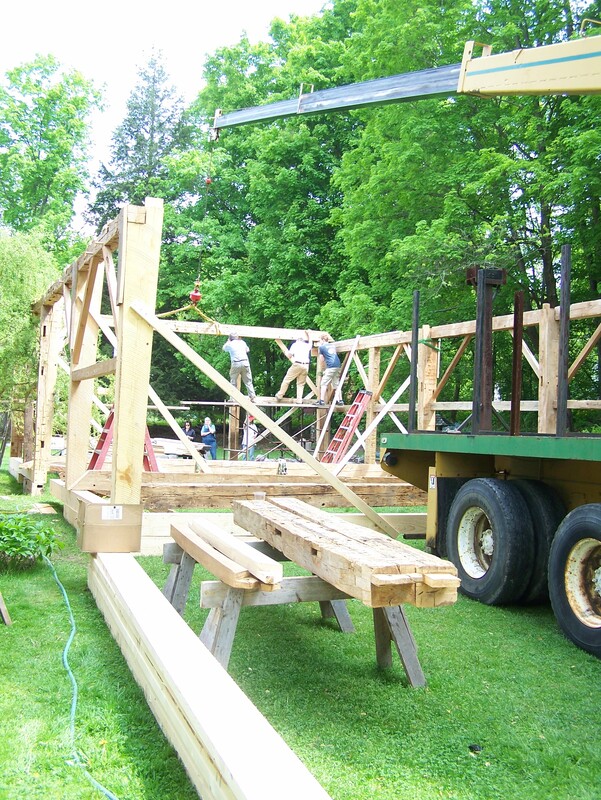 Before lunch, we were busy raising the 40 foot walls which now are tied together by the 25 foot cross timbers. By noon, the main cross timbers were up. In order to install the 25 foot cross timbers, we needed to add on various accessory timbers to ensure the integrity of the structure. By noon, the cross timbers were up! 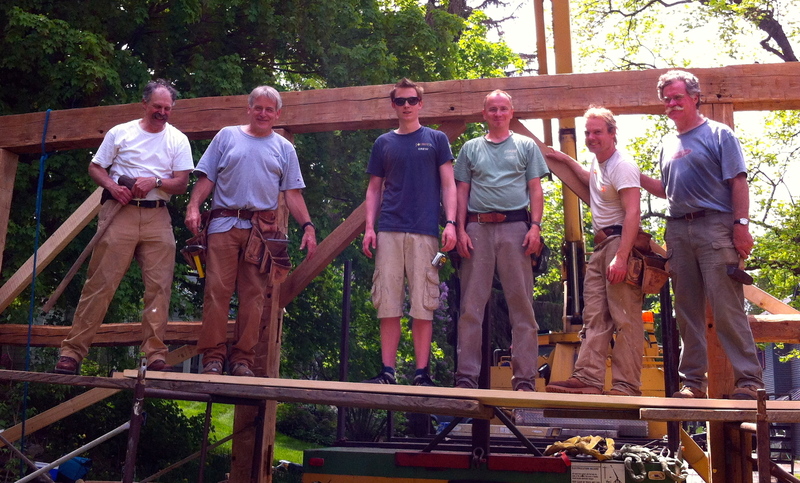 After taking a break for a delicious Sissy’s lunch, we hoisted up the principle rafters with tie timbers and bracing. After lunch, we built a temporary floor system to enable us to erect the principle rafter system safely. This floor system will also help us install roof boards and metal roofing. For visitors, it helps showcase the glorious potential of the frame; there is plenty of height in these walls and we can easily add a loft to this frame. Memorial Day weekend is always a busy one for Sissy’s and our small town of Middletown Springs, Vermont. The unofficial start of summer, we have held a parade here on the Sunday of Memorial Day weekend for the last 43 years. As she awaits a new owner, the frame is playing host to a variety of events in the yard of Sissy’s restaurant. It’s a sort of historical gazebo and inviting people to rest under its timbers making a great home for events in Sissy’s yard. Thar’ she is! 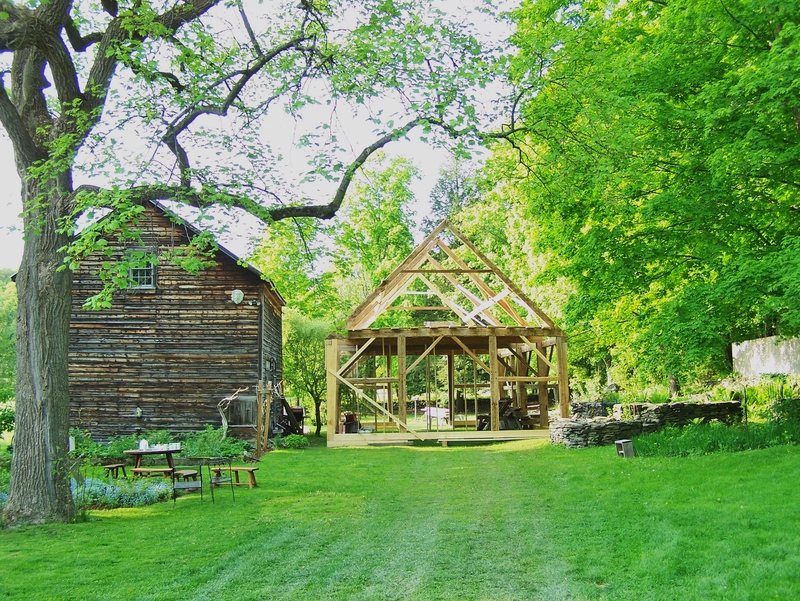 The restored, adjusted gunstock timber frame standing 25 feet wide and 40 feet long.The beautiful results of a hard day’s work. 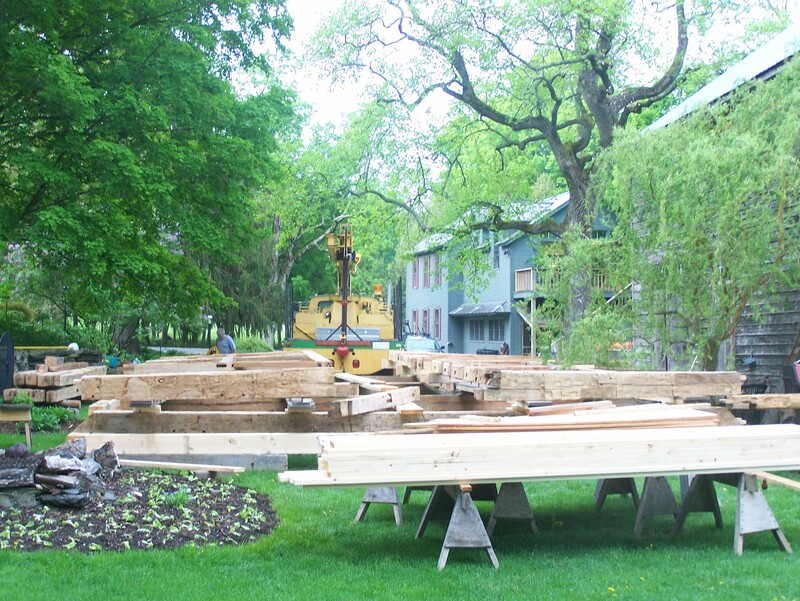 This timber frame is ready to last another 250 years! 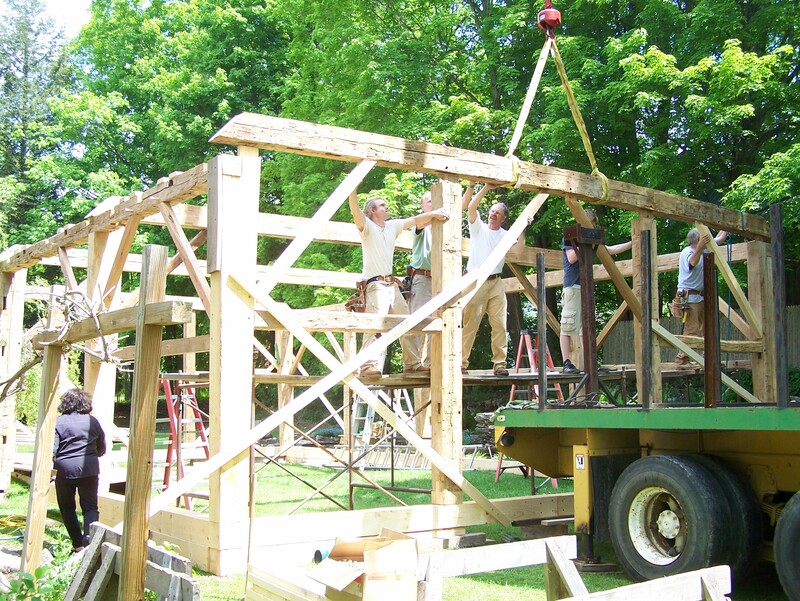 This reconstructed timber frame awaits her new home. 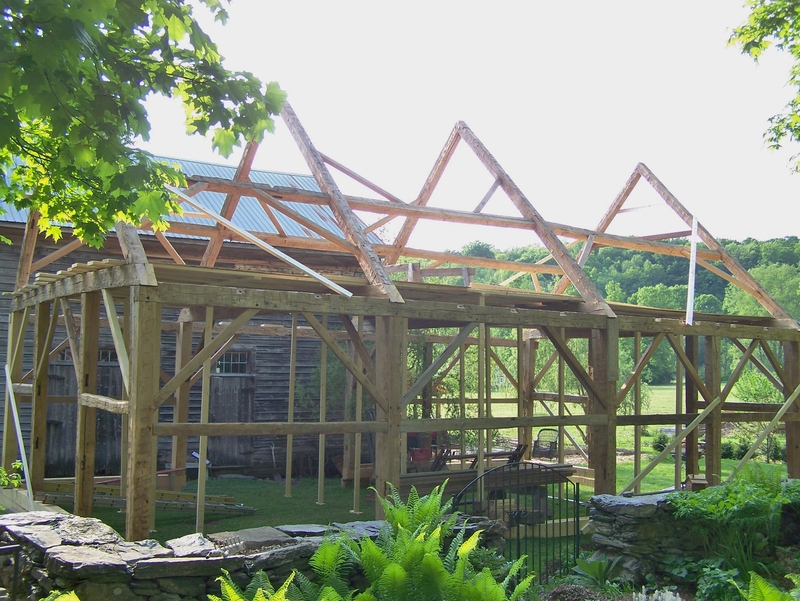 This entry was posted in Frames in stock, Green Mountain Timber Frames, Middletown Springs, Vermont and tagged barn homes, barn raising, barn restoration, barn style homes, Green Mountain Timber Frames, gunstock frame, gunstock timber frame, historic barn, historic properties, timber frame, Vermont timber frame by Green Mountain Timber Frames. Bookmark the permalink. Thanks again for your support. 250 ish years ago the original timber framer did all the work. 1000 hours of TLC gives it that chance to live another 250 years. What keeps me going Brother, is what I see in place like Asia and Europe. If we as modern Timberwrights can educate those behind us, and facilitate understanding in our clients, (and potential clients) I know we will see a “renaissance” in this artisan craft. It has only gotten stronger; even through this economic downturn, since the 1970’s. 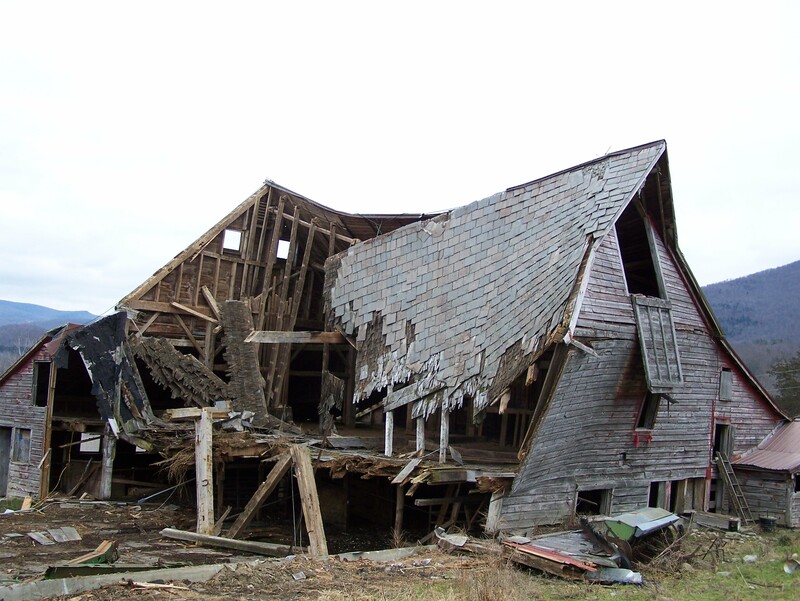 I believe, short of a calamity of global proportion, that this frame you just finished saving and revitalizing will live long under your generous salvation and the care of the new homeowner(s) for much, much, longer than 250 years. I envision a future, particularly in places like Vermont, a architectural-cultural presence in 1000 years that will rival many other places with extensive “wood architecture cultures,” such as you find in Asia and Europe.